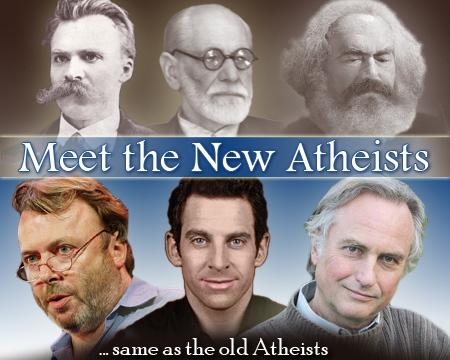 New atheists. That is what we are called by some. I find the label somewhat misguided, but I understand why it is applied. Many people are not used to hearing about atheism, challenges to faith, etc. It is new to them. They may know atheists, and likely do not know that those people are atheists, but they may know that they don’t attend a church or participate in any faith. Many people, atheists included (but don’t call them that!) prefer a reverential approach to their believing neighbors. They don’t bring it up because they don’t really care or they find it distasteful. 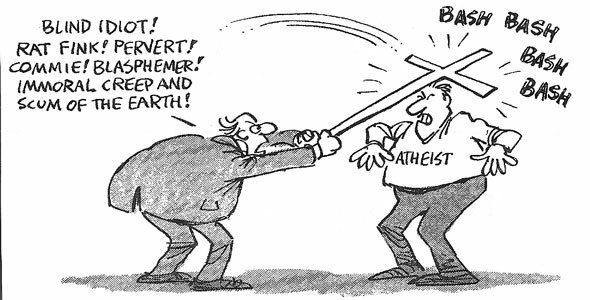 And so when they see us, the “new atheists,”TM they view our criticism and challenges as overly aggressive in our tone and approach. They view these aggressive tactics as hurting our cause in society by pushing people away rather than trying to be their friends. I don’t see evidence for this harm. 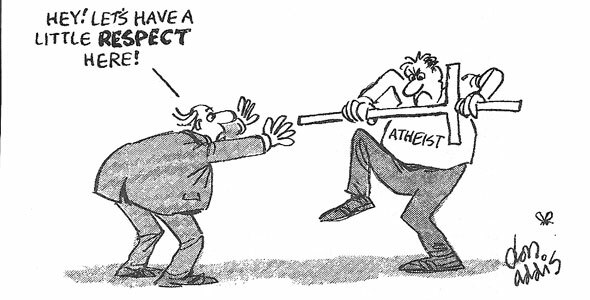 I see theists becoming defensive because they are not used to the criticism. I see their coddled status being taken away, and they don’t like it. Why shouldn’t we be critical? Religion does cause harm. Faith, belief without or in spite of evidence to the contrary, is largely responsible for the anti-intellectual and anti-scientific fervor that exists in various cultures, particularly our own American culture. But those faitheists and accomodationists will continue to claim that religion is good in many ways and that we are being too harsh in denouncing religion wholesale. I agree. I think that there are aspects of religion and religious culture that are good. Religion can be good; it helps people in need, supplies hope, and it provides a basis for teaching morality. Or at least one kind of morality or another. Yes, religion can do these things, but I see no reason why only religion of faith can do these things. A religion of faith? Why add that qualifier, you may ask. Well, first of all not all religious people necessarily have faith, depending on your definition of faith. Further, not all people that have faith necessarily have a religion. Religion is…well, religion is complicated. I will not try to define this term here, but I want to address it in a tangential way. There are sets of emotions, behaviors, and dispositions that tend towards ‘religious’ behavior. It can include rituals, music, states of mind, etc. But this is an expression of a more general psychological disposition that we all, or at least the vast majority of us, share. It is expressed through music, poetry, the fine arts, and perhaps even philosophy. It is an expression of those experiences internal to each of us that feels like it is coming from somewhere…else. It is sublime, beautiful, and it has its own subtle rules and constraints that we can apprehend in rarer states of mind. When one is enthralled in an ecstatic moment, there is a kind of flowing of emotion, meaning, and beauty that seems to transcend us. It doesn’t actually transcend us, but it gives the sensation of transcendence. As a writer, I know this well. There are time when, in writing, I find myself almost transported and feel as if the words are coming through me, as if I were but a conduit for some ideas. I understand the concept of inspiration. I know why people think that God works through them because I feel that experience myself. So, why am I an atheist then? Well, because when I’m in that state of mind, I’m being creative. I’m using natural tools of my brain to create, understand, and communicate. I am not being methodical, careful, nor remotely scientific. That is, I am not concerned with what is true in these moments, even if at some of these moments I may get the delusional idea that there is more truth there than in cold, rational, analysis. Beauty is truth, and truth beauty? There is a sense where the moments of beauty and poetry that overcome me seem to reveal a kind of truth. It feels as if the universe has opened up to me and given me a slice of something that my rational mind was unable to find. And sometimes, upon further reflection, I find that it may have found a bit of truth before unseen. But that is the important part of that; upon further reflection. Because how many times have ideas or thoughts from inspiration turned out to be duds? Most of the time, some if the time? Always? I suppose it depends. But it is upon sober, rational reflection that we will find whether or not the moment of inspiration has given us gold. The reason is that there is a difference in approach. The moments of beauty, sublimity, and transcendence are the result of our brain doing what it does, not as it can be trained to do. And I’m glad that this part of our minds exist because it is from these ecstasies and sublimities that we create. Not discover, elucidate, or comprehend, but create. The aspects of our minds that find revelation, communicate with the spirits, or attain a slice of heaven are the same parts that write novels, create sculpture, and write poetry. In this mode of thought there is a freedom of form, expression, and a lack of criticism. Yes, that’s it; a lack of criticism! Not that we can’t look at two creations and judge one or the other more or less beautiful (or at least argue about why we think one is more beautiful), but that one looked on its own not criticized in relation to the world, generally. It is not pointed at and said that the thing does not appear to be like anything else that is real. 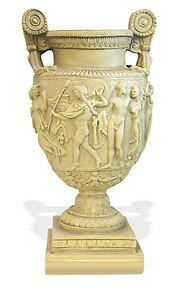 A sculpture of a dragon is not looked at and scolded for not representing a real animal. A poet is not criticized for not representing a real conversation or speech. A theologian is not criticized for not representing the universe as it really is. That’s not the point, right? Well, if you talk to Karen Armstrong, you may get such a response. But the fact is that theologians, most of them anyway, do claim that they are describing reality. They are not merely creating, they claim. They are talking about not only truth, but Truth. But where do these truths come from? 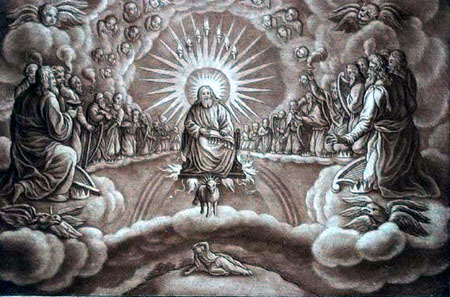 Revelation, communion with a deity, book (which ultimately go back to revelation or some claimed historical event), etc. They come from the mind, and many of them from ancient minds not trained in the meticulous rational skills which would be necessary to analyze these experiences. When theologians tackle these issues, whether today or the ancient theologians that dealt with these religious beliefs, they only apply rational thinking to keep the stories internally consistent while forgetting that the person who first experienced the idea was as fallible as you or I in determining truth from these internal experiences of ecstacy and transcendence. If we want to discover what is real, we need to be meticulous. We need to check assumptions, use empirical methods, and try to devise a way to prove our idea wrong. And so long as we cannot prove it wrong and the evidence supports the idea, then we provisionally hold our hypothesis as true. The longer it withstands scrutiny, the more it becomes a theory. Not just some guess or inspiration, but an idea that stands up against attempts to knock it down. 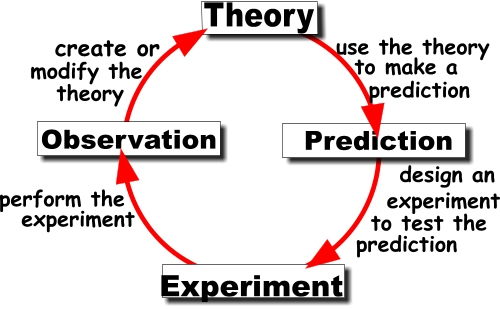 In other words, we need to use the scientific method. Perhaps not. Or perhaps it can. That is not what is at issue. What is at issue is that our minds are capable of different kinds of thought. Some of our mental capabilities provide for us this ‘religious instinct’ that we are all familiar with to some extent. But this instinct is part of our creativity, and is only tangentially helpful in a pursuit of truth. Our creative powers may, occasionally, provide us with insights into a new way of thinking about a problem, but once we have the idea we must switch to using our learned critical skills on to test the idea. We cannot just dream and create answers to real world problems, we have to criticize them. Our creative powers which provide us with the transcendent experiences, sublime emotions, and inspiring ideas are a great tool for the creative process, but not for attaining truth. If we want to know what is real, we need to be critical, meticulous. and scientific. Religion claims to have truth; it claims it knows something about what is real. By being critical of those claims and the methods by which those claims are attained, atheists (‘new’ or not) are not being disrespectful. Anyone who claims to have the truth and who subsequently calls criticism of their methods or conclusions disrespectful is either insecure about their position or does not understand how to think critically. In many cases, it is both. So yes, the parts of our mind that religion uses; the creative, transcendent, and sublime aspects of us that supply us with beauty, love, and all of those wonderful things are great. So, if that is all that religion is, then there is not much of an argument. That is, if the vague and meaningless God of theologians like Karen Armstrong is all that religion provides–a thing that need not even exist to be important–then religion is simply a nice story with which I can have little quarrel. But if religion also deals with what is true, at least in the same use of ‘true’ as we mean when we say something is real, then criticism is warranted. I may find many aspects of religious practices to be beautiful, but I don’t think they are true. And that is what is at issue. If those artistic expressions that come from creative people–mythology, morality stories, and the like–are not intended to be literally true, then they are just stories we can enjoy on their own merit. But this is not the case. Christianity, Islam, etc are believed to be actually true and real, not just stories. Anything that is proposed as the truth in society of culture is open for criticism. To actually step forward and do so is the responsibility of a citizen who cares about the truth, reality, etc. To postulate a story about the universe as true and then remove it from the realm of critical analysis, or to not at least try to validate it oneself while having faith in it is not strength nor reverent behavior, but weakness. Allowing ourselves to be swallowed up by stories birthed in the ecstatic moments of artistic creativity and then to claim it to be true is not clear thinking. We need to train ourselves to be better thinkers and to accept criticism or to get used to feeling disrespected. Respect is not warranted when art is presented as truth. 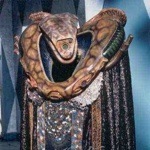 The truth, as the Vorlons say, points to itself. It does not need us to create it.